"I feel like there are so many crazy people who are mad at me right now." 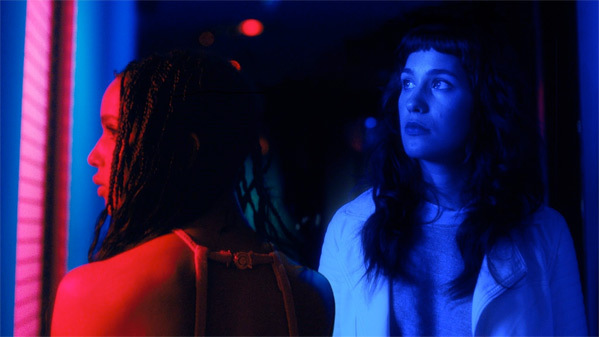 Neon has released a trailer for Aaron Katz's Gemini, which premiered at the SXSW Film Festival and also played at BAMcinemaFest this summer. The film received rave reviews and is already being referred to as one of the best of 2017. Gemini is about a heinous crime that tests the complex relationship between a tenacious personal assistant and her Hollywood starlet boss. She travels around Los Angeles attempting to unravel the mystery, confronting her own understanding of truth and celebrity. Starring Lola Kirke, Zoë Kravitz, Nelson Franklin, Greta Lee, James Ransone, and John Cho. Based on all the buzz and footage from this trailer, I'm already completely sold. One fest review calls it "a fantastic neo-noir set in the Thief-inspired Los Angeles of Drive." A heinous crime tests the complex relationship between a tenacious personal assistant and her Hollywood starlet boss. As the assistant travels across Los Angeles to unravel the mystery, she must stay one step ahead of a determined policeman and confront her own understanding of friendship, truth and celebrity. Gemini is both written and directed by American filmmaker Aaron Katz, of the films Quiet City, Cold Weather, and Land Ho! previously. This first premiered at the SXSW Film Festival earlier this year, and also played at BAMcinemaFest and the Locarno Film Festival, too. Neon will release Aaron Katz's Gemini in select theaters starting spring 2018, though no exact date has been announced yet. So what do you think?